Our protagonist sails to Moville in the county of Donegal – almost at the northern tip of Ireland to watch the races. While there he meets Mary, ‘the star of Moville’ and emboldened by whiskey he talks to her and buys her a drink – but then she rejects him and he sails home… The singing of Len Graham is wonderful! Find out about the song’s origin here. Don’t be too put off by the photo! 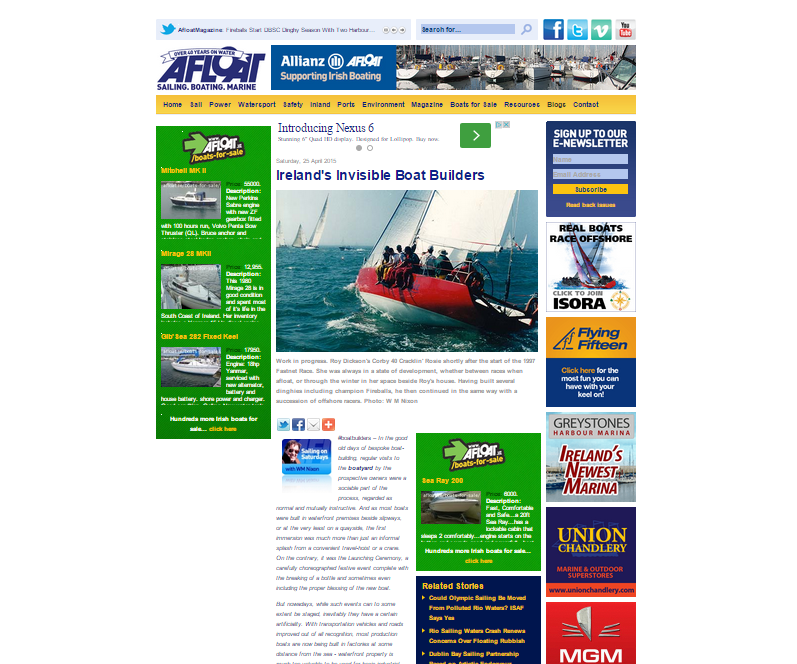 The Afloat website has a nice piece about boat builders in Ireland that includes veteran Jimmy Furey, who builts beautiful Water Wags and Shannon One Designs, new generation traditional boatbuilder Dougal MacMahon, the current wave of interest in building Bray Droleens, and a project at Clontarf Yacht & Boat Club building a clinker IDRA 14. These fabulous historical shots come from the National Library of Ireland on The Commons – a collection that’s well worth a bit of time, and not just for the boat and sea related shots.